A vegetable skeleton? Why not? Nothing is more scary to kids than vegetables. I am always on the lookout for something that I can make for a Halloween party that doesn’t involve candy. Over the years, I have promoted Mandarin Pumpkins, Banana Ghosts, and Pretzel Brooms (see below). This year, I am adding a vegetable skeleton to the mix. My 13 year old created this vegetable skeleton and ate a bunch of veggies while she did it. Did I mind? No! Munch all you want. You can do this with any vegetables (or fruit) you have. 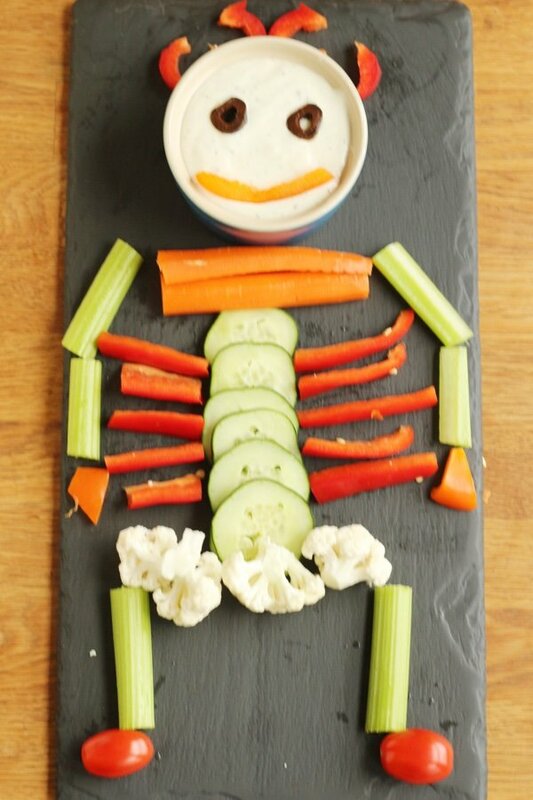 I do like the look of the red pepper strips as the ribs of the skeleton and cauliflower for the pelvis. If I am bringing this to a Halloween party - I put it together on site. Skeletons do not do well in transit. I don’t want to demonize sugar but SUGAR IS SATAN. This is a rough holiday for those of us trying to cut back, no? My kids are going to be trick or treating and I have found that the candy doesn’t taste that good to me. They don’t seem to like it all that much, either. What they do like is collecting it and then arguing about it (and then I throw it away when they aren’t looking). 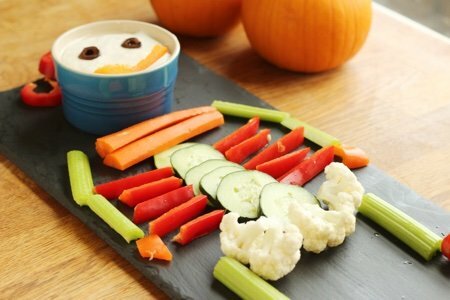 Here are the instructions for how to make these cute healthy Halloween treats. Peel mandarin oranges (smaller ones with no seeds) and shove a small stick of celery into the center to make a stem. Wrap if not serving these immediately so the mandarins don’t dry out. Cut banana in half and press Cheerios onto flesh. Eat immediately or soak banana in lemon juice before putting on Cheerios so they don’t turn brown. Slice a cheese stick in half and cut several slices into one half of the stick. Shove end of pretzel stick into flat end of cheese stick to make a “broom”. 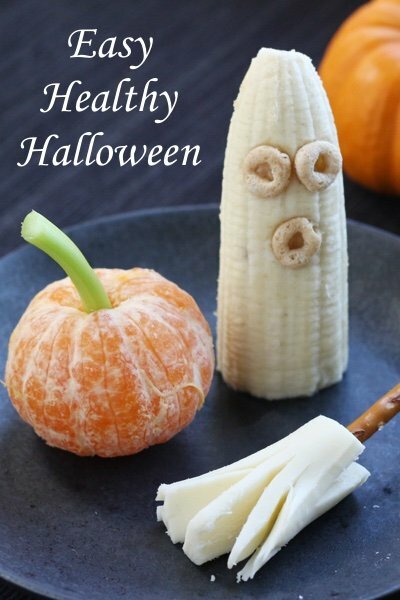 Please share your healthy Halloween tips! We can use as many as we can get. We’ve been trying to cut out sugar for about 2 months and had declared Saturday of this week as sugar day. We wound up hardly eating anything we thought we would. We split a Little Debbie nutty bar, couldn’t even finish one package of Reese’s Pieces together. But we did spring for a Krispy Kreme pumpkin spice cake donut each. It about made us sick but it’s seasonal so we wanted to get it while we could since it’s our favorite. We decided simultaneously we’ll gladly get back to trying to keep the sugar out. Love it! Wish we could hand those skeletons out on Halloween. Adorable recipe. Perfect for Halloween. Thanks. These are great ideas. Even works for those office parties.